Wonton Jalapeno Poppers are another way to enjoy the classic jalapeno poppers that we all love. Filled with cream cheese, Cheddar cheese, and fresh jalapenos this is a snack you don’t want to miss. I have to admit I have been in love with jalapeno poppers for a long, long time. They are one of my favorite all-time snacks. I first tried these back in college. I worked at a really unique store, only in East Texas, Coldspring, Texas to be exact. This place was called Stubby’s, with a name like Stubby’s you know you are in for a real treat. We were a gas station, an RV park, a Washateria (that’s a laundromat), a video rental place, we had a kitchen we were did short order cooking, a convenience store, and we sold gas, and off road diesel. I was the person doing the cooking after 5 and on the weekend. This is where I encountered the jalapeno popper first. I think I saw the idea of doing this in a wonton wrapper while on pinterest. Did I mention I am on Pinterest? So I knew I had to create these. This version of pays homage to Fran of Thinrecipes.com. Who is known to make a pretty mean jalapeno popper. In my recipe you will need some wonton wrappers, cream cheese, sharp Cheddar cheese, jalapeno peppers, and some worcestershire sauce. I am going to leave it up to you if you want these hot or not. What actually makes the pepper hot is the capsicum within the pepper. Jalapeños have 2,500–10,000 Scoville heat units, which means they can be mild or pretty hot. Personally when chopping up many of these at once, I like to wear gloves, because they seem to burn your hands for a long time. If you are me, I am later taking these capsicum coated fingers somehow sticking them near my eyes, only to be tearing up next. If you don’t like your peppers too hot, the capsicum is held in two major areas, that would be the seeds and the ribs inside of the pepper. If you remove these two areas you will remove most of the heat. Elise Bauer of Simply Recipes suggests how to distinguish between a hot jalapeno pepper and one that isn’t is to look for striations on the pepper. Perfectly smooth peppers will be less hot, and those with those small brown striations that are typically focused on the top and the bottom of the pepper will be hotter. It is really the capsicum that makes the pepper hot though, and that heat is held in the seeds and the ribs of the pepper so adjust how much heat you enjoy. If you lead a gluten free lifestyle Noy Soy brand makes a gluten free wonton wrapper. 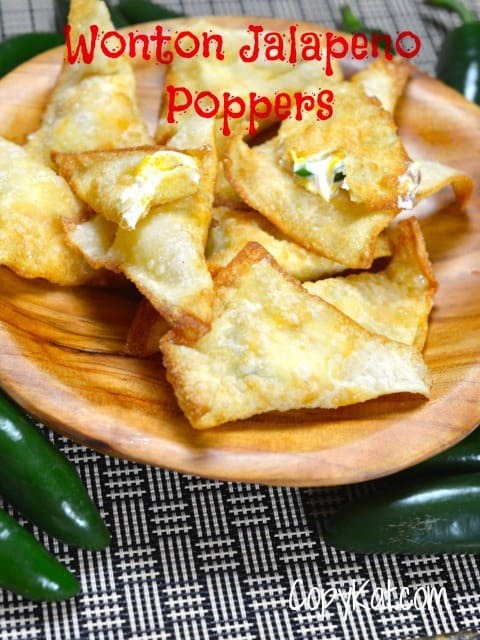 Wonton Jalapeno Poppers are a great appetizer to bring to a party. Wontons are filled with a cream cheese and spicy filling. Mix together room temperature cream cheese and grated Cheddar cheese in a medium-sized mixing bowl. Add Worcestershire sauce, and chopped jalapeno and mix well into the cream cheese mixture. Add about 1/2 teaspoon of the filling to the wonton wrapper. Dip your finger into water and run your finger along 2 sides of the wonton wrapper. Fold the dry edge onto the wet edge of the wonton wrapper and press the edges together. Make sure that they wontons are well sealed. Add enough oil to the cooking vessel so the bottom 3 to 4 inches are covered. Heat oil to 350 degrees. Cook the wontons for about 90 seconds turning when brown on the first side, and then cooking until browned on the other side. Remove and drain on a wire rack before serving. How long should you wait (to be sure they won’t open up) before putting them in the fryer? Love these- thank you!!! I’ve tried making ‘jalapeno poppers’ and they didn’t turn out like I wanted. These are much easier and I already had some wrappers- I intended on making crab puffs, but these were easier and just as good. “Capsicum” is the scientific name of a genus of plant, and often refers to the fruit ofthose plants. The SHU is determined by “capsaicin” content, and is the chemical source of the spiciness. So simple but great. Thank You. I hope you give these a try. I love the flavor of a jalapeno popper.